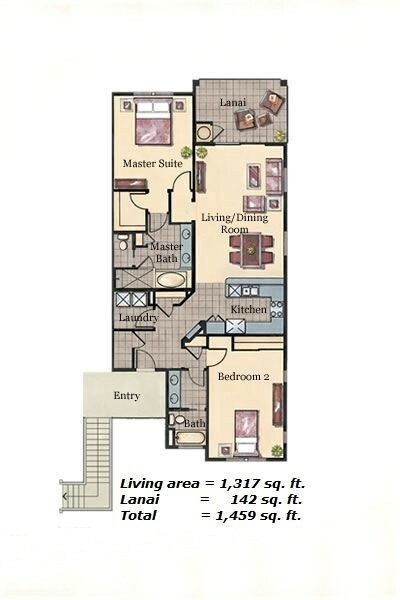 Property Size 1,459 sq. ft. 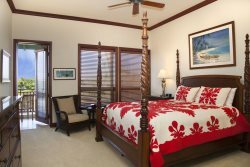 Welcome to Hali’i Kai Resort Villa 2D ~ Halii Kai 2D is a brand new 2/2 villa furnished in February 2012. This upper level villa enjoys views of the Waikoloa Beach Golf Course. The home has been comfortably furnished to sleep six, with a king in the master suite and two double beds in the guest suite. The living room is furnished with an amazing 60” flat screen television equipped with HD. An inviting couch, and arm chair welcome you to lounge in cushioned comfort. The lanai has a full size Weber gas grill, and includes an outdoor dining table for 6 for relaxing casual dining in the tropical air. In the guest suite are two double beds and a flat screen television. The large closet doors are mirrored which creates an expansive feel. The guest bath also has dual vanities and a tub/shower. The villa is equipped with central air conditioning, a full size washer and full size dryer. Halii Kai is one of the few resorts that has a private tennis court and basketball half court, located a mere 3 buildings down the road from Halii Kai 2D. The Coconut Grove, located 1 building away from Halii Kai 2D is a serene park like setting with picnic tables, hammocks and barbecue grills. Hali’i Kai is well known for it’s gorgeous Ocean Club which overlooks the Pacific Ocean. 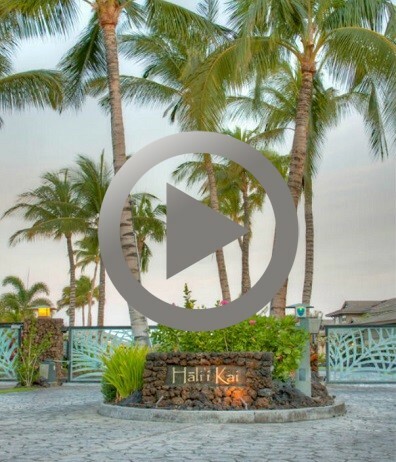 The Hali’i Kai Resort requires a check in fee for all guests. Effective September 1, 2012 the check in fee is $10/night + tax with a 30 night maximum charge. The fee allows guests access to the private Ocean Club with an open air bar and grill. The exercise room at the Club looks out to the sea, where whales are frequently spotted during their winter visit to the Islands. The Ocean Club has a beautiful pool, hot tub, shaded seating areas and barbecue grills. I have lived on the Big Island for 14.5 years and also worked at the Luxury Resorts. I can say this was one of the best experiences I have had from initial contact, during and at the end of my stay. The condo was beautiful, nicely decorated and very well equipped with everything you may need for your entire stay, including beach chairs, beach bag & towels, boogie boards, and even tennis rackets. I highly recommend not only this property but also Kohala Luxury Rentals LLC. Thank you for making our family gathering so very special.